It is not just because they are really good friends (both Chris Williams and James Reid were present at our wedding in Franschhoek in 1998) that we’ve been working together since The Foundry was conceived over a kitchen table in Camps Bay some fifteen years ago. 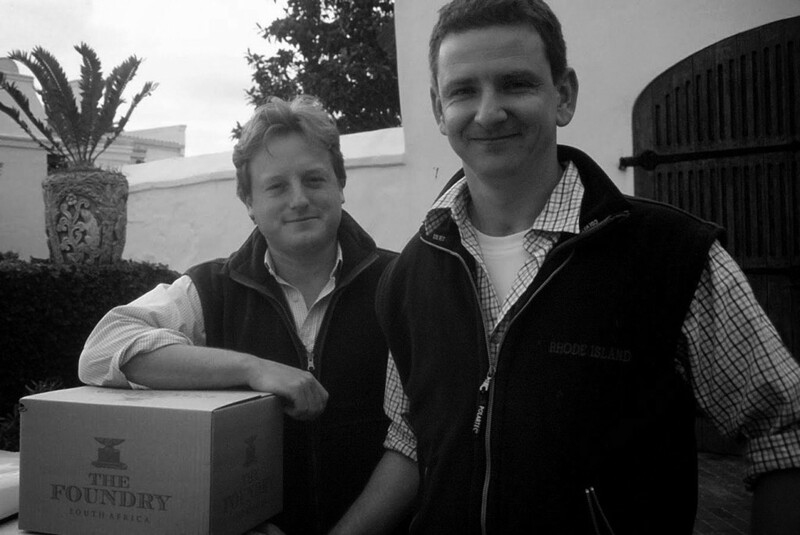 It just so happens that Chris Williams also responsible for making some of the best wine in the Cape. This was something that was immediately vindicated when the maiden Foundry 2001 Syrah was awarded a five star rating (one of only 17 for the year) in the 2004 John Platter Guide. With James acting as a sleeping partner (he needs to retain a low profile in the venture since his day job is managing Accolade Wines South African interests), Chris remains the main driving force in the winemaking and being the face of The Foundry. He spent his apprenticeship under Georgio dalla Cia at Meerlust and did a ‘stage’ in Pomerol with Michel Rolland before, in 1999, leaving to set himself up as a consultant. During this period, he took on the challenge of winemaker at (the then under-performing) Delaire in Stellenbosch, but when Giorgio finally announced his retirement, the Myburghs invited Chris to return to Meerlust as cellarmaster; a post he took up in time for the 2004 vintage. Apparently, during this period, his mail was still being delivered to the farm, such were his emotional connection to the estate. The condition of his return to Meerlust was that The Foundry could continue unhindered so, after three vintages, the project secured a more permanent home. The grapes for the 2001 Syrah came from the Cape Town side of the Bottelary Hills in Stellenbosch, but with the wine being vinified in Paarl, the wine lost the right to its appellation and could only carry a generic Western Cape designation. The wine had an extended period in oak, not by design, but due to the fact that Chris had a near fatal motorcycle accident in November 2002 which left him in hospital for three months. The grape source for the 2002 Syrah were as per the first vintage, but with the introduction of an additional parcel from Rhenosterkop in Agter-Paarl. No Platter five star this year, but then 2002 is recognised as a very difficult vintage in the Cape. However, I thought the wine was always more elegant and refined than the more flattering 2001. The 2003 Syrah was vinified at Delheim during his brief tenure there, with grapes continuing to come from the same two vineyards. The difference, however, came with a 3% addition of Viognier, introduced in the form of lees, where Chris believed it acted as a fining agent, adding brightness and helping to lift the Syrah fruit profile. The 2004 and 2005 were both produced at Meerlust (from the same two vineyards). At this time, a decision was made to hold back the release of the Syrah in order to give the wines a little more bottle-age before they came to market. Until this point, were selling out prior to them really being at the peak of drinkability. From the 2006 vintage the fruit source changed, and since then the Syrah comes from a single estate on the Helderberg, not far from Meerlust itself. After toying with the idea of continuing to use Viognier as a blending component, Chris decided to retain the wine as a pure example of the variety. Details on the more recent vintages of Syrah can be found on The Foundry website. We received such great feedback on the first vintage of Viognier, released in 2004. The grapes were bought into the cellar initially as a blending partner for the Syrah but, at the last moment, Chris decided to give the grapes their own identity, fermenting the wine in some second-hand Meerlust Chardonnay barrels. The notoriously frugal Chris jokes that he has no issue with this, since he knows the provenance of the wood and gets them at a good price…. The ongoing success of the wine, I believe, has something to do with the fact that the profile is not obviously varietal, but something more complex and mineral. From the start, it has always maintained more restrained and muted style, developing often Chenin-like nuances as it ages in bottle, and displays none of the ‘tart’s handbag’ trait so often associated with the grape. The 2005 came from Wellington fruit and underwent a part natural fermentation, with one fifth going through malo-lactic. A bottle tasted recently (July 2014) was still in spectacular condition, which only helps proves the durability of the style. The 2006 Viognier came from the same Wellington site, but enjoying the cooler climatic conditions of the vintage. It too underwent a part natural fermentation. The 2007 vintage was produced from two vineyard sites, the existing Wellington fruit, blended with a new source in Faure, close to the Meerlust cellar. Chris saw this very much as an experimental vintage, electing to continue with the cooler, more maritime grapes for all subsequent harvests. Details on each of the follow-on vintages can be found on The Foundry website. In 2009, Chris bought in a parcel of Grenache Blanc, sourced from Willi Mostert in Voor Paardeberg and elected to ferment the wine using the same techniques as employed with the Viognier. Although a relatively newly planted vineyard, these grapes until now, had been delivered to one of the large wholesale merchants who had failed to take any real interest in what they were working with. In the hands of Chris, the result was staggeringly good, especially when back-blended with 15% Viognier. The wine had a low alcohol of 12.5% and delivered great linearity and freshness, with the Viognier component sitting on top of the acidity, adding a little texture and varietal interest. The wine picked up a Platter ‘Five Star’ rating at the first attempt. After a swift and someone bullish negotiation, we managed to secure the whole parcel for the UK market for a steal. After the Platter result, the whole industry piled into the vineyard trying to gain access to the fruit. Needless to say the price per tonne rocketed and Chris finds himself now having to stand in line and negotiate with the rest. The follow-on 2010 vintage was awarded the ‘Best Value Wine of the Month’ in Decanter magazine. Details on the more recent releases can be found on The Foundry website. In 2010, Chris managed to secure a small parcel of Roussanne (still considered obscure in the Cape) from a vineyard across the road from the Meerlust front gates. This too was blended with a little Viognier and lees from Grenache Blanc which helped to add a different dimension and complexity to this varieties somewhat monotone profile. More information on the Roussanne is available on The Foundry website. A more recent development has been the purchase, by James, of a farm at the foot of the Paardeberg mountain. Apart from the pretty (and typical to this region) wooden-framed house, there are a few hectares of vines whose crop was traditionally delivered to the local co-operative. James and Chris are now working on reducing yields with a view to seeing what these vineyards might be capable of for the future. There is also a plan to relocate The Foundry here at some point, thus giving this otherwise nomadic brand (the first four vintages were each made in a different location) a more permanent home. It would be a fair appraisal to suggest that a good deal of work would be required on the existing rudimentary cellar to make it a viable entity, but having said that, Staart (the name of the farm, and no, that’s not a spelling mistake) was where Eben Sadie vinified his first two Columella releases….